Exclusively from our Estate collection, come an intricate and dark pair of earrings from David Webb. David Webb is the quintessential American jeweler of exceedingly modern jewelry. 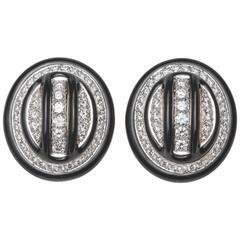 Driven by art, design and bold pieces these clip on earrings embody David Webb’s swirl and grand pearl elements. The brooch is set with a 2x15mm South Sea pearl with 91 round brilliant diamonds (1.04ctw). 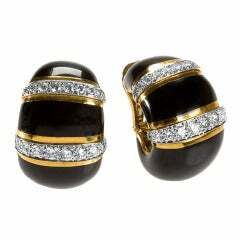 Set in 18K yellow gold with platinum and surrounded by black enamel. This dramatic piece comes with a certificate of authenticity. Elegant 18k white gold Diamond and South Sea Pearl Earrings, set with 6.15 carat of round Diamonds and 2 South Sea Pearls 17MM each.